Join us today for regular friendly social and competitive badminton with feather shuttles on London best badminton courts – the best value badminton club in London! 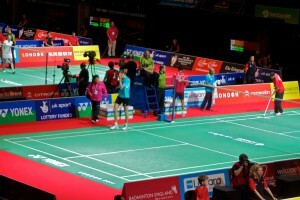 Why London Met Badminton Club? We don’t do micro-management – only play the games you want to play! Join the club for free. You don’t have to be a LondonMet student. To attend our sessions you MUST register with Meetup and book for FREE www.meetup.com/londonmet/. Please read the rules and FAQ – that should answer most of your questions. We Provide Professional Racket Stringing Service and UKCC Level 2 Qualified Coaching (One to one or group). Annual membership gives you a reduced rate for attending London Met Badminton Club sessions. Membership is optional and you don’t have to get one to join the session. You can book a spot for up to 2 friends and you are responsible for them showing up. There is are fines for no-shows. Before every session, we print out the list of attendees. You must have your full name displayed on the list to gain entry into the building and security may get fussy at times. If you are booking guests, please provide their full name(s). There are restrictions on beginners: they may attend only the sessions specifically assigned to them. Beginners are encouraged to take some coaching to be able to keep up with more experienced players and not cause frustration for both sides. Feather shuttlecocks will be available for games in the tubes in the middle of the hall. If you want to warm up or exercise please use knockers form the carton box. Once you have finished the game and the shuttle is still OK to leave it near the tube with new shuttles so that others could use it for their next game. Pay to the organiser present at the session and make sure organiser marked you as paid on the list of attendees. Do not abuse the shuttlecock system: take one shuttle at a time, do not deliberately hit the feather, pass on a decent shuttle to the next pair. Do not abuse other players, behave humbly and with respect to organisers, other badders, security and other users of sports facilities. Leaving without paying will not be tolerated. Don’t risk being banned, do not forget to pay your fee. The building security will shut the building in the building at 9pm or 10pm depending on the session. So, the session will effectively finish 10 minutes prior to allow time for packing and paying up. Please finish the last rally and stop playing when an organiser asks you to. If you are taking a shower please allow enough time for that. Help with setting up the nets and clearing them at the end is hugely appreciated! London Met Badminton Club, London Met University, organisers or any other party involved in running the club will accept no responsibility for death, personal injury, stolen or damaged property or any other damage occurred on the premises or in course of the badminton session.